A haunting life and death struggle for survival, based around the stabbing of John Finch by the eighteenth century prostitute, Sally Salisbury. What causes a young woman to stab her fiancée in front of a restaurant full of witnesses? Is it a crime of passion? Or a premeditated act of violence? Or some kind of exorcism? This one act play tells the story of how a young woman discovers the truth about the spirit that has shared her mind since she was a little girl - the spirit of an eighteenth century prostitute called Sally Salisbury. As far as Lucy is concerned, Sally has always been there, her constant 'imaginary friend'. But when Lucy falls for Robert Coyle, a young history lecturer, doubts start to creep into her mind about Sally's 'story'. What really happened all those centuries ago between Sally and her lover, John Finch? When Sally was abandoned, and cast into prison, what forced her spirit to survive? History says one thing; Sally says another - but which is the truth? What has caused her to survive at any cost? What has led her down the centuries, from generation to generation? What does she want? Burning is available from Production Scripts. 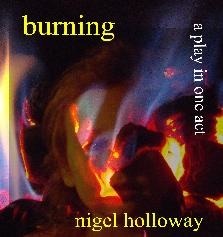 The audio play version of Burning soon to be available.